Dallas Woodhouse, N.C. Republican Party executive director, speaks during a Jan. 21, 2019, news conference in Raleigh. 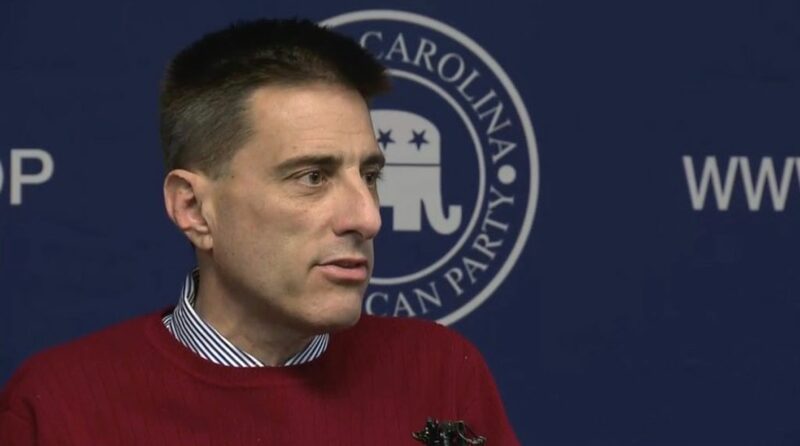 Dallas Woodhouse, former TV reporter and grass-roots activist, announced Monday, April 15, he would leave his position as executive director of the N.C. Republican Party after the party’s state convention in June. Woodhouse confirmed the announcement Monday morning to several media outlets. “My contract expires at the end of the state convention. With the election of a new State Chair, and after four challenging years, a tenure longer than most in this post, I am moving on,” he wrote in a text to WRAL News. The NCGOP’s executive committee met Sunday night to discuss Woodhouse’s future with the party. Acting state party Chairman Aubrey Woodard said Monday that Woodhouse would stay through June 15. State party Chairman Robin Hayes was indicted, along with megadonor Greg Lindberg and two of Lindberg’s associates, several weeks ago in an alleged bribery scandal targeting state Insurance Commissioner Mike Causey. Causey cooperated with federal investigators. Woodhouse has said he testified in December before the federal grand jury investigating the alleged scheme. He wasn’t indicted and has said he isn’t a subject of or target of the probe. Hayes relinquished most daily activities with the state party after making his initial court appearance. The four defendants have pleaded not guilty. The party also is recovering from the election fraud scandal in the 9th U.S. Congressional District. The Rev. Mark Harris, a Republican and the apparent winner of the November election, withdrew after the State Board of Elections conducted a four-day evidentiary hearing into allegations of illegally tampering and manipulating absentee ballots by a contractor who worked for the Harris campaign. The board voted unanimously in February to order a new election. It’s scheduled Sept. 10. Ten Republicans will seek the GOP nomination in a May 14 primary. The winner will face Democrat Dan McCready, who trailed Harris by 905 votes on election night, and Libertarian Jeff Scott, who finished third in November, along with Green Party candidate Allen Smith. Woodhouse led the state party through the 2016 and 2018 election cycles. He was a media fixture locally and nationally as he touted the party’s conservative agenda and assailed Democratic proposals. He was a reporter for NBC-17 from the 1990s until 2001. In 2006, he became the N.C. state director for Americans for Prosperity, a grass-roots conservative advocacy group.